Evyn Lê Espiritu shares with us her unique experiences spending time with the students in VietAID, the Vietnamese American Initiative for Development, in which she taught them how to conduct oral histories within their families. It was July 9, the first Wednesday of VietAID’s six week summer program. A roomful of middle-schoolers stared expectantly at me, still sweaty and excited from their previous hour of exercise. Most of the twenty-seven students were Vietnamese. Some had been born here in Boston; others were recent immigrants from Vietnam. A couple students were mixed-race; several students were not Vietnamese at all, reflecting the diversity of their neighborhood, Dorchester. I nodded to Ronnica Rogers, my co-instructor, and wrote the name of the workshop on the whiteboard: “Digital Storytelling.” I planned to teach the students to conduct oral histories within their families and to create short films about how Vietnam’s past affected their present. But this was a mutually-constitutive project; one that would change and evolve as we worked together. Dorchester, one of the largest and most diverse neighborhoods in Boston, is home not only to a historically-rooted African American population, but also a diverse array of recent immigrants from Vietnam, Ireland, and Cape Verde. Founded in 1994 by community leaders and residents, VietAID—the Vietnamese American Initiative for Development—is the nation’s oldest Vietnamese community center. 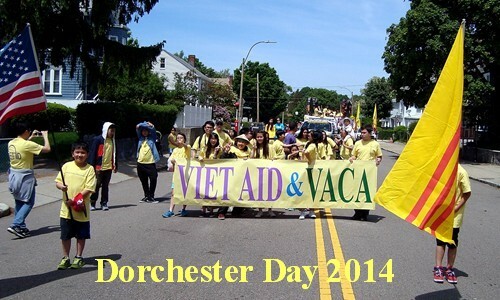 It now serves over 7,500 Vietnamese Americans in Boston and the surrounding areas through its various programs. In addition to promoting civic engagement and community building, developing affordable housing and commercial space, providing small business technical assistance and micro-enterprise development, and offering high quality child care services, VietAID runs VSPY—the VietAID Scholarly Program for Youth—which each year serves around 150 local students from grades one to eight and recruits over sixty high school students to work and volunteer in the classroom. It’s an amazing program: a multiracial cast of instructors, teachers’ aides, and organizers enrich the students’ academic development with eight hours a day of Math, Language Arts, physical education, and field trips. But despite its emphasis on the under-served Vietnamese population, the program had surprisingly little structured time for Vietnamese cultural engagement or history. This is where “Digital Storytelling” came in: for six two-hour sessions, the middle-schoolers of VSPY would learn how to research, plan, storyboard, film, and edit short films about their family immigration stories, the Vietnam War, life as a Vietnamese American in the diverse neighborhood of Dorchester, or the scene in contemporary Vietnam. It was a program of special importance to me. An aspiring artist academic myself, I first became exposed to filmmaking and oral history in college. I created several short films about my grandmother’s immigration story; the discovery of my famous grand-uncle, a South Vietnamese war hero; and my positionality to these histories as a multiethnic intellectual. The experience was life-changing. I was able to hear stories that had been hidden in my family history, and re-tell them with my own artistic voice. It was an experience I wanted to share. I contacted Marisa Imon, one of the VSPY’s head organizers, and she was more than supportive. I thank her for this opportunity. I developed the “Digital Storytelling” program with Lena Nguyen, one of the Vietnamese American VSPY instructors, and conducted it with Ronnica, who was connected to VietAID through the esteemed MLK Summer Scholars program. Ronnica is a talented artist and video producer in her own right, and she proved an indispensible help. I could not stay in Boston for the full length of the six-week program, so Ronnica boldly took over when I left. She helped the students film their shorts and was in charge of editing the final pieces. I cannot thank her enough. After years of repression—both self-inflicted and government-enforced—Vietnamese Americans are beginning to share their stories and family histories on the Internet, interweaving spoken word, creative reenactments, and Vietnam War footage. These videos speak against dominant representations of the war that center the white American male soldier’s experience, such as Miss Saigon, Full Metal Jacket, and Apocalypse Now. It was from this archive of contemporary self-representations that I drew, sharing a number of key examples with the VSPY middle-schoolers on the program’s first day. From there, we began brainstorming and storyboarding our own video self-representations. It was a bit difficult at first: difficult to engage the gravity of the war, to establish trust and rapport with the students, to get them to feel comfortable sharing their own experiences, and to build self-confidence in their own creative ideas. But eventually and almost suddenly, I felt a shift: after a week the students chatted with me in both Vietnamese and English and excitedly fashioned props for their skits out of construction paper. With the invaluable help of the other instructors, we went over storyboard ideas and jumped into the filming process. I felt enlivened by their energy, by the promise these youth held. They were engaging with their family histories in new ways, taking representation into their own hands. Evyn Lê Espiritu is a UC Berkeley Rhetoric PhD student and filmmaker interested in the politics of memory, the aesthetics of diaspora, and the spatialization of historical production. She currently studies the South Vietnamese refugee population in Israel as a means to problematize diaspora, citizenship, and sovereignty. Please take the time to share this post. Sharing (on email, Facebook, etc.) helps spread the word about diaCRITICS. Join the conversation and leave a comment! What do you think of sharing oral histories?